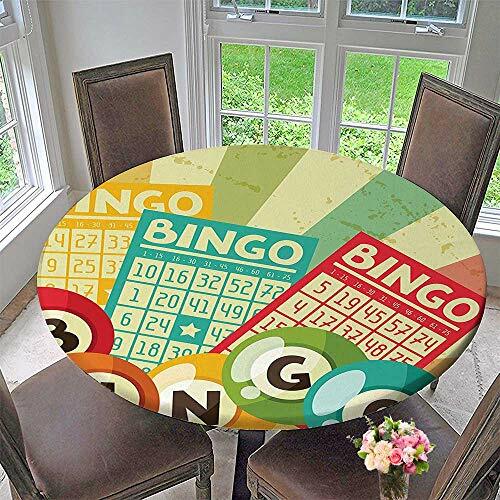 Mikihome Round Tablecloths Bingo Game with Ball and Cards Pop Art Stylized Lottery Hobby Celebration Theme or Everyday Dinner, Parties 31.5''-35.5'' Round (Elastic Edge) by Mikihome at USA Online Bingo. MPN: SBYZB-DL-fok-13450D90xD90. Hurry! Limited time offer. Offer valid only while supplies last. This is a retro and elegant tablecloth, making your dining table unique. Gorgeous patterns, relaxed dining atmosphere, it is worthy for you. Hand-washing and machine washing are all available，but we suggest hand-washing and not dewatering, you can medium temperature ironing. 1.Durable Polyester fiber tablecloths and feature elasticized edges for a smooth & snug. 3.Product features：easy to care, Machine wash, cold, gentle cycle. Tumble dry low. Lightly iron if necessary.